Hello! My name is Colby and I have had the honor to be invited to take part in Plum and June's Blog Hop and I have a tutorial to share with all of you! If you want to get to know a little bit more about me, click here to see the questions I answered about my quilting life! This is an original design that I created for my Modernista Swap Partner. I wanted it to be modern and simple but allow for customization in the design. It's an open sided sewing machine cover that can be adjusted to fit the size of your individual machine and the style of your sewing space. I will reference the colors I used to stay consistent throughout the tutorial, but feel free to substitute your own colors or fabrics. This is for my partner's machine which is slightly bigger than my machine so the fit shown above is off but it will work on hers! This specific tutorial is for a machine that measures 12.5" high x 17" long x 7" wide. To calculate the size of your completed panel, take your length + 3" to find the length of your panel and take your height and multiply by 2 and add your width + 4". Width: 17 + 3 = 20"
Length: 12.5 x 2 = 25, 25 + 7 + 4 = 36"
Note: All seams are 1/4 in. 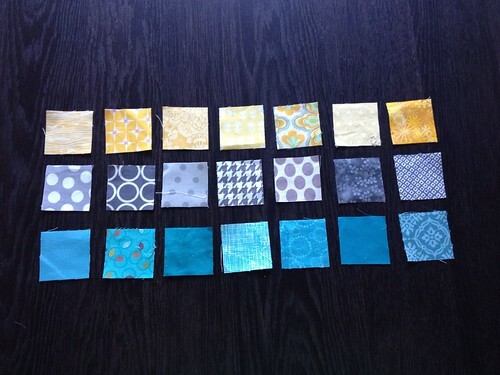 Step 1: Arrange your 2" squares into a 3x7 grid in the order you desire. 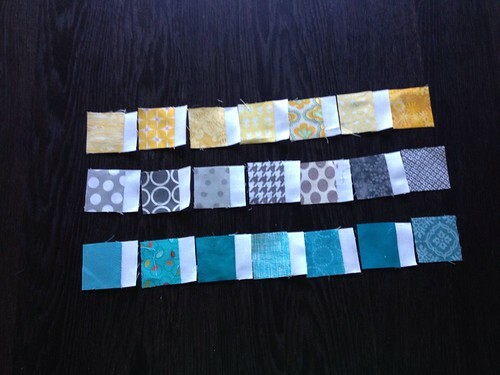 Step 2: Take your 1" strip and sew it right sides together to the first 6 of the 7 2" squares of each color. Cut apart and press seams toward the square. 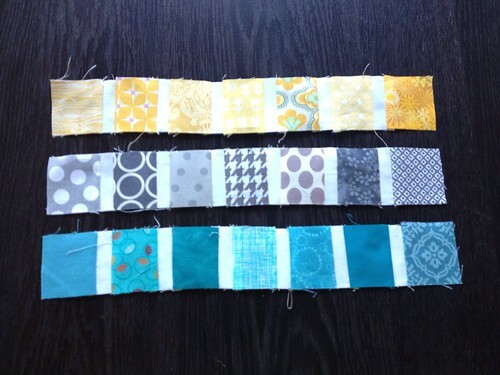 Step 3: Sew the pieces of each color together into a strip to form 3 strips, 1 of each color. Press seams toward the squares. Step 4: Take your first color strip and right sides together, sew another 1" strip along the bottom side of your color strip. Press seams towards the 1" strip. Repeat for your second color strip. 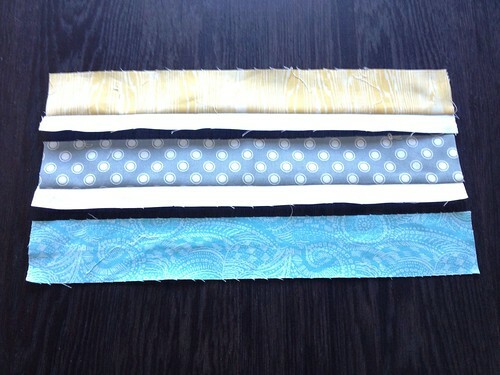 Step 5: Take your 2.5" strip and sew along the bottom edge of the third color strip. Press seam towards 2.5" strip. you now have 3 completed rows. To make your back panel is a very similar process, just simplified. Feel free to repeat the front process for the back panel as well or do scrappy piecing to make your strips for the back panel. 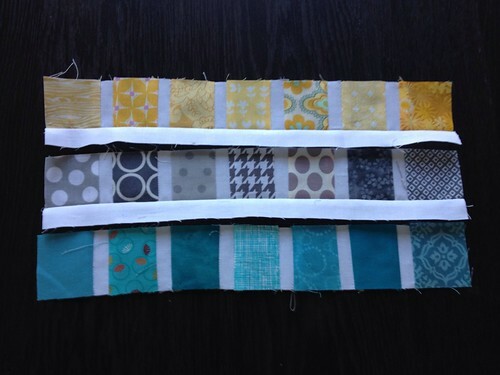 Step 7: Sew a 1" strip to the bottom side of your first and second color strip. Press seams toward the color strip. 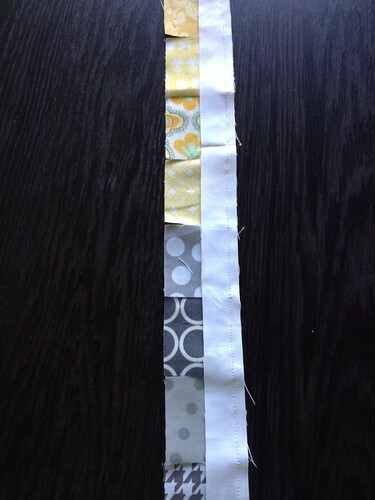 Step 8: Sew a 2.5" strip to the bottom of your third color strip and press the seam toward the color strip. 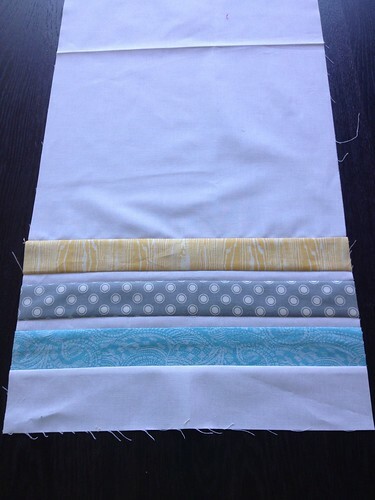 Step 9: Sew your 3 strips together, as you did you for first panel, right sides together. 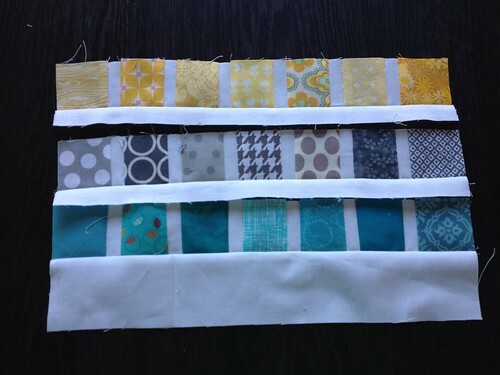 Press seams toward the color strips. You have now completed you back panel. Step 10: Trim your pieces to the same size. Mine ended up at 13.25" wide x 7.5" high. To figure out what size your middle piece should be subtract your height x2 from the length you calculated at the beginning and add 1" and that will be your height. 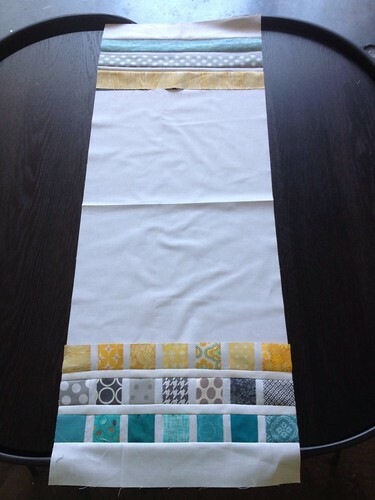 Ex: 36-(7.5x2)+2 = 22"
For the width, just use the width of your trimmed pieces, mine is 13.25". Therefore I need a 22"x13.25 inch middle piece. Lay your pieces out as followed: back panel upside down, your 22"x13.25" piece, then your front panel right side up in preparation for sewing. Step 11: Sew the back panel to the 22"x13.25" piece, right sides together. 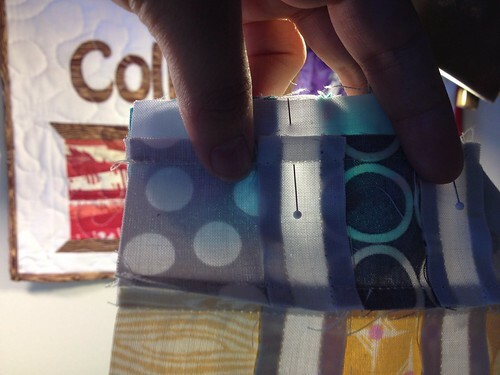 Press the seam towards the color strip. Step 12: Sew the front panel to the other other end of the 22"x13.25" piece. 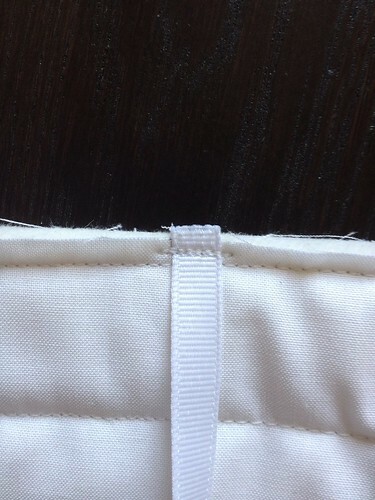 Press the seam towards the white panel. 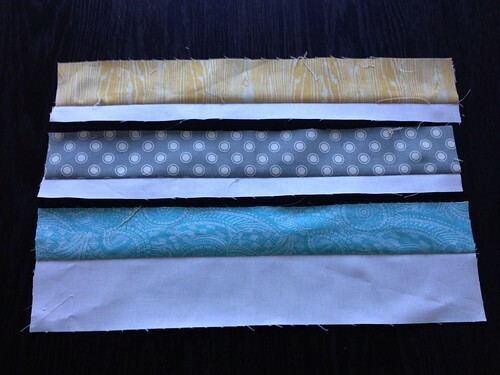 Step 13: Take the 4" strips and sew one along each of the long sides of your main panel. Press seams towards the 4" white strips. Note: If you want to add any hand detail or embroidery, do so at this point. Step 14: Layer your backing fabric, your batting, and then your main panel together and pin or spray baste in preparation for quilting. Step 15: Quilt the sandwich as desired, I personally chose vertical lines. 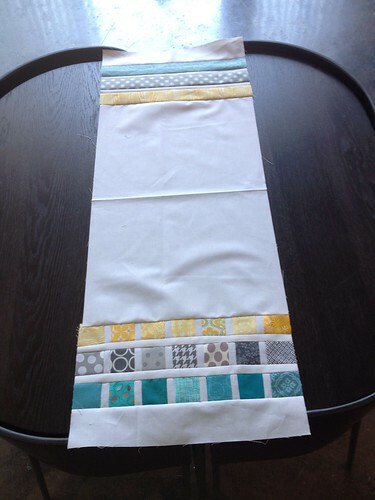 Step 16: Trim to 36"x20". Step 17: Attach your 2.25" binding in your preferred way. 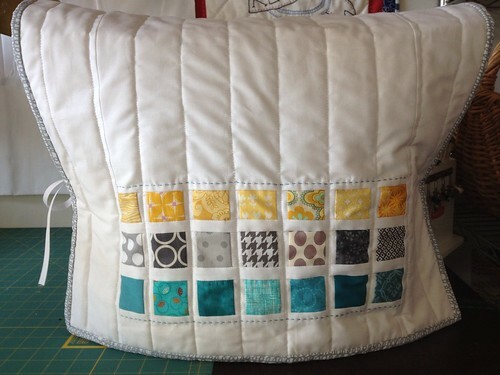 I personally like this tutorial by Red Pepper Quilts. 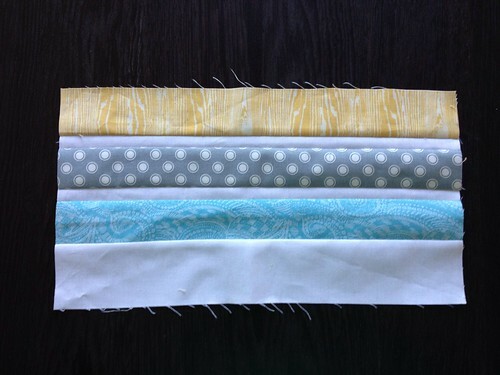 Note: Before completely sewing down your binding either by hand or machine, take your 4 coordinating pieces of ribbon and pin on the back side of your piece approximately 6" from the top and bottom of each long side. 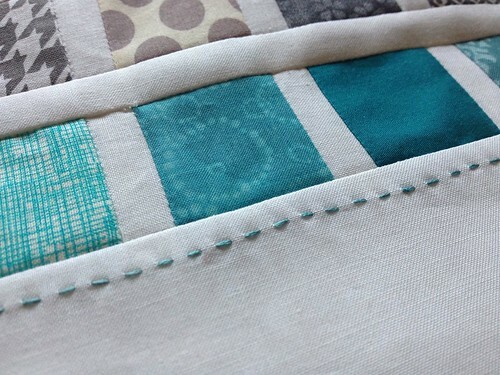 Sew down right inside your seam line to tack down. 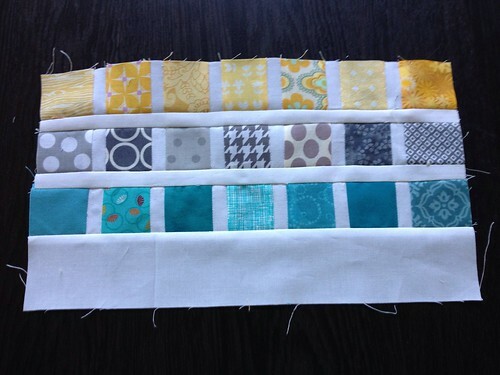 Continue to sew down and finish binding. Step 18: Fold the panel over your machine and tie on each side. 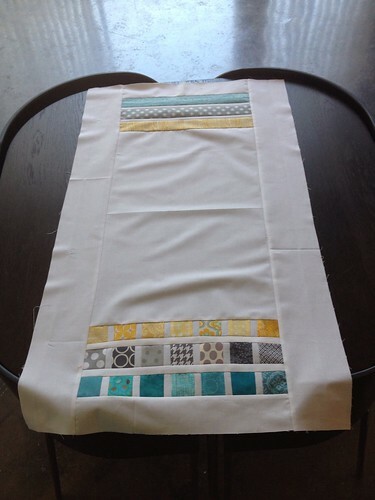 Your Modern Sewing Machine Cover is complete! This is for my partner's machine which is slightly bigger than my machine so the fit is off on mine, but it will work on hers! I hope you enjoy! If you have any feedback or have any questions about any part of the process, feel free to leave a comment or email me! I love this project. I keep intending to make myself a cover for my machine, but I have yet to get around to it. It seems I never put myself on the top of my priority list!! 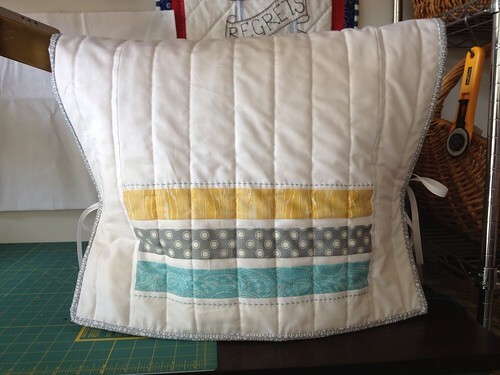 Such a great looking sewing machine cover! Love it! I already saw and loved this in the swap flickr group -- beautiful job!! Great tutorial, Colby! 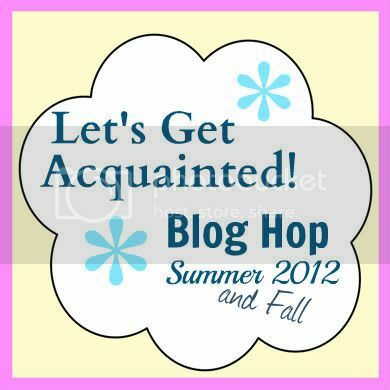 Nice to meet you through the blog hop. This is very original. Think I'll have to try adding one to my "to sew" list. Thanks! Very nice!! Thanks for the tutorial! Wow! I love this! Especially the little hand stitching detail! Beautiful. Thank you for sharing! Beautiful cover and great tutorial. My machine came with a hard cover, but I want to make a cover I think it is more personal. You have given me great inspiration. I love your tute! I really must make one. I've got a hard case but I don't use it much and this is so much prettier! This is so beautiful - love your handstitched details and the pretty colours. So cute! Thanks for the tutorial, great job. Very cute cover! Love the little squares! Nice to meet you Colby and what a cute sewing machine cover! 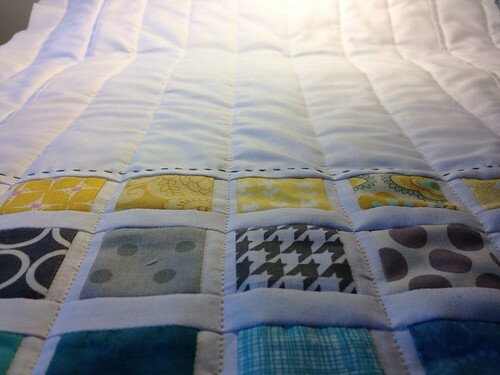 Love the little squares and hand stitching! great tutorial! You have a great style. Hi There lovely to meet you, sorry I am late! Your work is beautiful and your sewing machine cover is just gorgeous. As soon as I have my own work room I will be making one. For now I have to store my machine away in a carry case every time I am finished with it as I have to use the kitchen table! When you are starting to sew and don't know if you are really going to like it, I would recommend cheap sewing machines that are affordable. Beautiful cover! Sewing may not be a hobby for everyone but for those that wish to learn how to sew may benefit from a sewing machine that offers basic functions but with updated features that will help the user improve her craft. Great tutorial, Colby! Nice to meet you through the blog hop. This is very original. Think I'll have to try adding one to my "to sew" list.